This document describes the advanced JSGI implementation by the stick framework. Applications built with stick are modular web applications using middleware composition. Every stick application can be configured from the outside using the configure() function. While this is a beautifully simple concept, the nature of functions is that they encapsulate functionality, hiding it from the outside. This makes it hard to provide application-wide configuration. stick's goal is to define a JSGI application that allows itself to be composed out of modular middleware components. For this stick defines an Application object. It's a JSGI application, but with some additional methods and features. When talking about the application object, we usually refer to a stick Application. The following example shows a simple no-op middleware. It passes the unmodified request on to the nested middleware and returns the result. The nextJsgiMiddleware function is a nested application defined outside the middleware function. 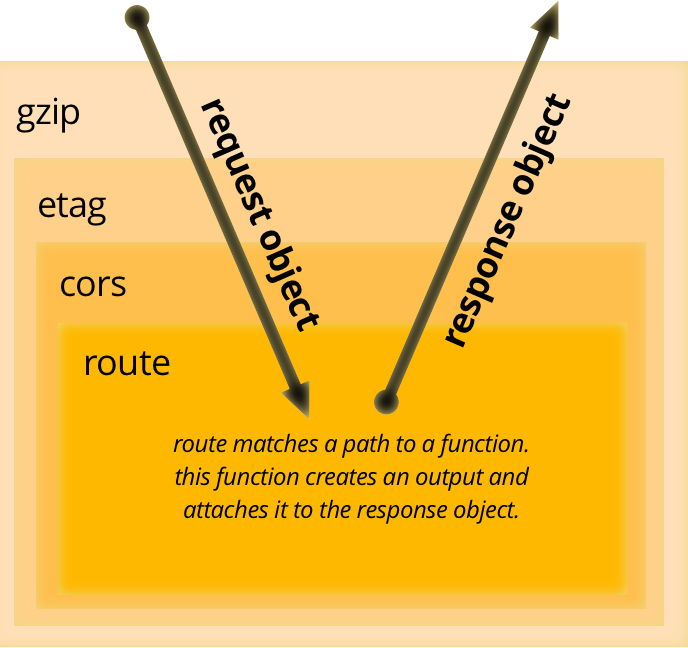 The according middleware chain for the example is gzip( etag( cors( route( unhandled())))). Unhandled is the implicit core of each middleware chain and triggers an error if it's reached. This means that requests with no matched route are unhandled by default. A middleware factory must return a middleware function, which typically wraps the nested JSGI middleware chain passed as first argument. It can attach functions to the application object called hooks. Furthermore a middleware factory can add new properties to the stick application object. This is useful to make the middleware factory configurable. The following example shows a simple logging middleware factory. It adds a enableLogging() hook to let wrapped middlewares decide if they need logging or not. If a nested middleware calls the hook, the logging middleware will log the request and response object before it returns. The Application object is a JSGI application that wraps a middleware chain. When invoked, the application acts as a proxy to its middleware chain, meaning it calls the middleware chain with the request as argument and returns the result. When called without argument, the application's middleware chain is initialized to a unhandled() function which throws an Error when invoked. will result in an application with responder() as JSGI middleware chain. will result in log(responder(unhandled())) as middleware chain. If a request reaches the innermost unhandled() middleware, stick throws an Error to inform all wrapping middlewares about the unhandled request. If none of the wrapping middlewares responds to this error, Ringo returns a HTTP 500 internal server error. Middleware factories may also add methods or properties to the application object as described above to allow their middleware to be configured from the outside. Applications have a env method that takes a single String argument and returns an Application object that shares the middleware chain of the original application, but can be configured to contain additional middleware that is not shared with the parent application. will result in development's middleware chain to consist of debug(profile(_parent_())). Repeated calls of the env method with the same argument return the same application object. By convention, modules are expected to export middleware factories as middleware. When passing a string to an application method expecting a JSGI app or middleware factory, that string is interpreted as module id, meaning the application will require() the module id and try to use the app or middleware property exported by the module.